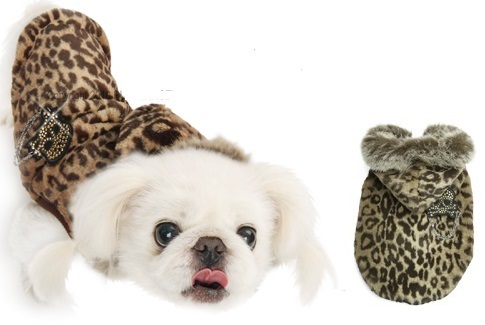 Animal prints are always stylish and this Puppy Angel Safari in the Sun Dog Coat proves it. Made from groovy leopard print the hood is trimmed in colour coded faux fur while the waist and armholes are trimmed in stretchy cotton for comfort. The coat is lined in satin-style fabric and it fastens with a zip up the chest. There is a detachable skull and chain brooch on the back for added punch.